This analysis is a great jump-off point. Your "what if the initial investors are corrupt and try to game the system" modeling raises some interesting questions: most of the obvious solutions conflict with the desire of investors for some near-term or immediate return or make the land more difficult to sell. Using NASA or other governmental and research enterprises as customers is probably the safest source of revenue while you develop other products and services. How much would Harvard or perhaps a consortium of Ivies, e.g., pay to have you set up and help operate a research center/astronomical observatory? If you come up with any suggestions for ways to modify the bill to prevent dishonest gain while still enticing prospective entrepreneurs with favorable terms, please pass your thoughts on to the AIAA team developing the legislation (link at the top of the post). I agree with you that Governmental support would definitely help generate sustainable revenue levels in the first decade of base use. NASA will pay to have astronauts at such a base. ESA and JAXA will pay too. But the question is how much would these Space Agencies pay? I like your idea of including universities – talk about prestige for Harvard, Yale, etc. (you are now entering the Yale Lunar Hydroponic Gardens)! But to date, universities have not gotten particularly excited about ISS participation which is much closer to earth, much cheaper to participate in (compared to a lunar base), etc. But a great angle to consider (perhaps participation in a commercial venture with guaranteed seats on every other resupply mission would entice them). 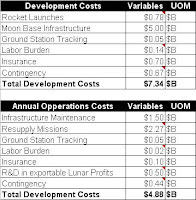 · Take your experiment to the moon program – Instead of one large customer (NASA), many smaller customers (similar to some of my space cargo agent posts – only focused on the moon instead of suborbital/LEO). · Raise your TRL – companies pay to have their prototype device included on the next lunar resupply mission (rovers, moon gloves, mining tools, moon dust repellant, etc.). The base tests the device and either returns the device or returns the data about device performance raising the technology readiness level in the process. · Lunar Rock auctions on earth. Own your piece of the moon. Each resupply missions would cycle crew – new crew to station, old crew returns to earth. Lunar rocks could be included on each return to earth. · Exclusive TV rights to one network (perhaps with imbedded Journalists) – NBC paid hundreds of millions of dollars for exclusive broadcast coverage of the 2010 Olympics in the US market. 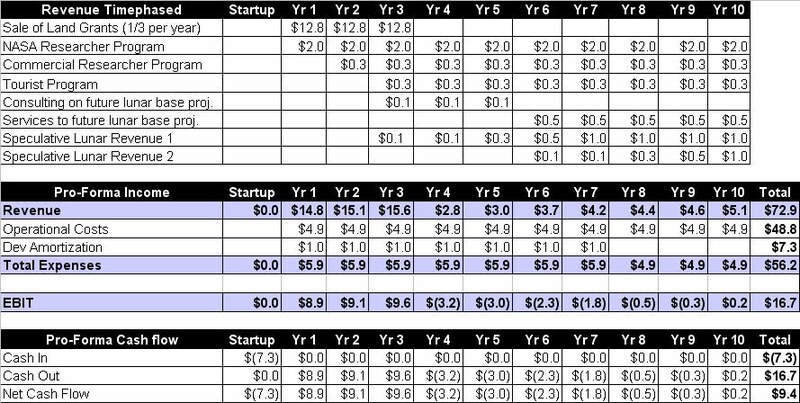 What would exclusive broadcast rights be worth in a US market, EU market, Asian Market? · Exclusive Marketing Deals – what would Nike pay to have the Nike “Swish” on the bottom of all astronaut boots?! · Lunar Sports – taking advantage of the reduced gravity to perform some amazing maneuvers for eager TV audiences on earth. · Make detailed lunar mappings available for purchase. This really should stand for a category. 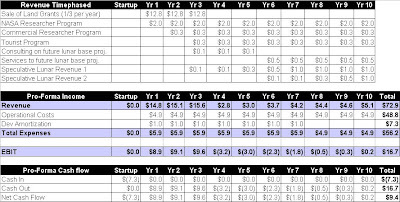 Look to turn costs into revenue. What elements of required base activity would someone else be willing to pay for (maps just scratch the surface)? 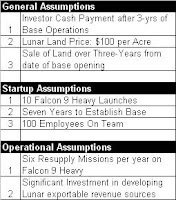 Have it in the bill that is it not just a base but a full fledged spaceport. Auction off predetermined plot sizes in the initial land grad instead of the fixed price of $100 an acre. The mountain tops and craters at the poles are more valuable than other regions on the moon. Yes. Definitely! I'm expecting a properly structured settlement to be designed to start earning enough to pay it's operating expenses (as opposed to its capital cost) almost immediately. Of course, the settlement's space ships will charge a huge amount for passage. The Russians are getting 20 to 30 million dollars per passenger to low Earth orbit. Imagine what rich tourists, government space programs, scientific institutions and companies that want to establish businesses on the moon would pay for round trip tickets to the moon. Therefore the settlement will want to design ships that carry as many passengers as possible to maximize that revenue. Transporting supplies and freight, in both directions, will also be very lucrative. "If land speculation and investment can pay to develop the infrastructure, many, many other uses for the land will open up. A few we can foresee: tourism related businesses, facilities for astronomy and scientific research, facilities for producing TV broadcasts for Earth (Lunar gravity will produce fascinating entertainment and sports programs), a landing field for visiting ships, with repair and re-supply facilities for those ships. Solar power collectors will take a lot of land, and location will matter a lot. But the most profitable uses will appear in the future and are certainly beyond our ability to predict now. Could Ponce De Leon have predicted that that "worthless" swamp in the middle of Florida would end up as Disneyland? Would you expect Lewis and Clark to predict that those 'worthless' snow covered mountains would eventually find very profitable use for ski lodges?" Why assume that all launches will be from the US? 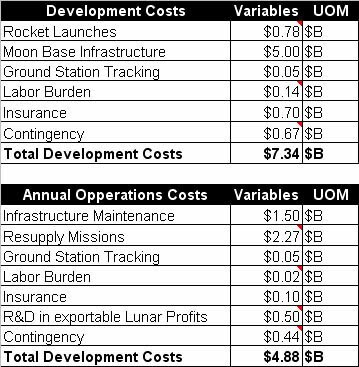 I would think the Kourou launch pad in French Guiana, and similar launch sites, would get quite a few of them, if not all, because of lower costs and easier regulations, etc. Finally, the purpose of this law is to create a permanent human space settlement, never to be abandoned. It should do everything possible to maximize the probability of that. 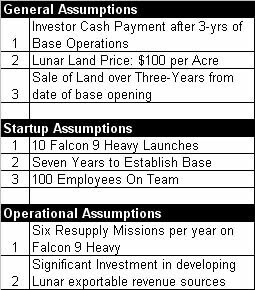 In http://spacesettlement.org/#18 I answered the question: "What if the settlement does not produce enough operating revenue to pay off its debts and make a profit?" "If not, then sooner or later it ends up like the Iridium satellites or the U.S. land grant railroads. The railroad companies went bankrupt, but the new owners kept operating the trains. Bankruptcy wipes out the debt, but the system still functions and the world has its benefits. This legislation must be structured to be sure that, if a settlement company goes bankrupt, its ships and settlement will be sold, if need be, for pennies on the dollar, to others who will keep them operating." But you have raised some good points on that subject, and land buyers, especially big ones, may well require the settlement to take out some form of performance bond or insurance to assure the land buyers that the ships will keep flying, even if the original settlement company were to default. (1) Sell the land as fast as you can to recoup your investment and fund the base in the early years. (2) Sell the land based on some strategy to maximize its price per acre. A few Strategies include: (A) make land available near current development (the base, solar farms, observatories, etc.) (B) make land available based on geological content (which you brought up). (3) One interesting idea I had was NOT selling the land at all but leasing it only. This way the consortium could maintain its ownership of the land and just allow others to use it for a period of time. "land buyers, especially big ones, may well require the settlement to take out some form of performance bond or insurance to assure the land buyers that the ships will keep flying, even if the original settlement company were to default." Your insurance solution may help solve my issue with consortiums abandoning a base after they sell the land grants. It may not actually prevent consortiums from abandoning bases and paying some sort of insurance penalty, but it may well keep the bases operational by transferring liability to insurance companies. Also, I encourage everyone to checkout www.spacesettlement.org. At this website, Alan Wasser answers lots of questions related to this Space property rights. Thanks Alan for your dedication to this work. And thanks for your comments, very helpful. There is only one problem: Who enforces US law on the Moon? Do you think China would care about US land claims on the Moon? Why do US people think the rest of the universe is just another state of their great nation? Although I will fully concede the US's general arrogance towards most international matters, I think Alan Wasser does a nice job addressing the issue of why American courts are so key to this whole Lunar Land Recognition plan. Checkout Alan's FAQ's here (especially question 20): http://spacesettlement.org/#20. To summarize Alan's point, since most of the buyer's of these land grants will be from the US, as long as those land grants are supported by US courts, the grants should sell well – at least in the US. By selling well, the profits from this sale help ensure the lunar base is in operation for many years to come. 1. The Chinese eventually start their own lunar base and claim an overlapping area of land. 2. The Chinese land a probe on the site of your future lunar vacation home .